I was in my house nestled near the foot of a group of mountains. mountain to a sacred site for the worship of the Goddess Diana. David offered to drive me to the place where I would begin my pilgrimage. and compose the poem. Then I started waking up. doing a painting of Lord Shiva who also wears a crescent moon on His divine head. I guess that this may also have been an event from a past life surfacing. In Roman mythology, Diana (lt. "heavenly" or "divine") was the goddess of the hunt, the moon and birthing, being associated with wild animals and woodland, and having the power to talk to and control animals. She was equated with the Greek goddess Artemis, though she had an independent origin in Italy. 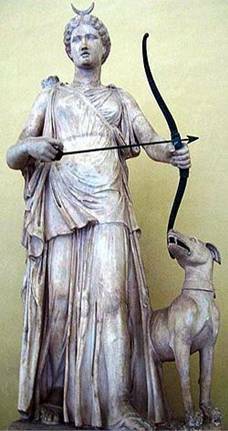 Diana was worshipped in ancient Roman religion and is revered in Roman Neopaganism and Stregheria. Dianic Wicca, a largely feminist form of the practice, is named for her. Diana was known to be the virgin goddess of childbirth and women. She was one of the three maiden goddesses, Diana, Minerva and Vesta, who swore never to marry. The celestial character of Diana is reflected in her connection with light, inaccessibility, virginity, and her preference for dwelling on high mountains and in sacred woods. Diana therefore reflects the heavenly world (diuum means sky or open air) in its sovereignty, supremacy, impassibility, and indifference towards such secular matters as the fates of mortals and states. At the same time, however, she is seen as active in ensuring the succession of kings and in the preservation of humankind through the protection of childbirth. These functions are apparent in the traditional institutions and cults related to the goddess. The institution of the rex Nemorensis, Diana's sacerdos (priest) in the Arician wood, who held the position till someone else challenged and killed him in a duel, after breaking a branch from a certain tree of the wood. This ever open succession reveals the character and mission of the goddess as a guarantor of kingly status through successive generations. Her function as bestower of authority to rule is also attested in the story related by Livy in which a Sabine man who sacrifices a heifer to Diana wins for his country the seat of the Roman empire. Diana was also worshipped by women who wanted to be pregnant or who, once pregnant, prayed for an easy delivery. This form of worship is attested in archeological finds of votive statuettes in her sanctuary in the nemus Aricinum as well as in ancient sources, e.g. Ovid. According to Dumezil the forerunner of all frame gods is an Indian epic hero who was the image (avatar) of the Vedic god Dyaus. Having renounced the world, in his roles of father and king, he attained the status of an immortal being while retaining the duty of ensuring that his dynasty is preserved and that there is always a new king for each generation. The Scandinavian god Heimdallr performs an analogous function: he is born first and will die last. He too gives origin to kingship and the first king, bestowing on him regal prerogatives. Diana, although a female deity, has exactly the same functions, preserving mankind through childbirth and royal succession. Diana was initially just the hunting goddess, associated with wild animals and woodlands. She also later became a moon goddess, supplanting Titan goddess Luna. She also became the goddess of childbirth and ruled over the countryside. Catullus wrote a poem to Diana in which she has more than one alias: Latonia, Lucina, Iuno, Trivia, Luna. “Great is Diana of the Ephesians!” (Acts 19:28, New English Bible).